They wanted to ship me out a new belt because they thought this one had stretched (after 5 hours of use???) I wasn't buying that considering it has a belt tensioner. I took the cover off that protects the pulley and was SHOCKED to see the top portion of the pulley had sheared off... Unbelievable !!!! Next, they were going to send out a technician to fix it; however, it was going to be 3 weeks. I informed them that in the Great state of VA you have to mow the grass every week during Spring and Early summer and I could NOT wait that long. I called the store salesman and he had never heard of such a failure and said it must be a part defect (duh) and I could get a brand new mower. I got a new mower that week and they picked up the old one. I used the 2nd Craftsman Excellerator GT 5000 for a total of 5.4 hours before another pulley broke. This time I was mowing (my 1.5 acres) and it started making a horrible sound which the neighbor guy heard immediately but I did not since I was using ear plugs. This time it was a pulley on the other size and it appeared to be have been reamed out in the middle which allowed it to wobble and vibrate. I purchased this mainly because my dad has had good luck with an older version of this mower. He has only replaced the battery in the last 6 years of heavy use 2+ acres... I'm done with Craftsman until they can get their quality under control. I'm going to try my luck with Husqvarna. BTW, this is the first Review I've ever taken the time to write. I would NOT buy a Craftmens Excellerator GT5000. 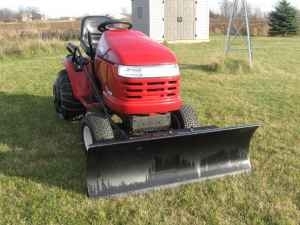 I bought my Craftsman GT5000 Excellerator with 26 HP Kohler and Hydrostatic transmission March 2010. I have used the tractor with mulcher, thatcher, rototiller, box/leveler scrapper and the Johnny Bucket Jr set up with the bucket and blade. I have moved over 80 cubic yard of top soil and fill for my lot with the attachments,not to mention I also mow an acre plus of land. I change the oil, oil filter, fuel filter and grease the spindles and mower deck and other maintenance per the manual. I also use Sta-Bil fuel stabilizer and Lucas Oil additive in all my fuel. I would not trade this tractor for any other. It has worked like a well tuned clock. As far as customer service goes, I have never been connected with anyone other than ENGLISH speaking operators who have been very polite and helpful even if they had no idea as to what I was talking about. My experience with them and the service by the repair men have been great and timely. Not that they drooped everything and everyone else just for me but putting me on the list and receiving very good service. My only problems have been imagined by myself on 2 occasions (paranoia I guess)and have been looked at by the tech only to find that everything was fine, we even had a little laugh about it. Some complain that the hood does not fit tight but that is an easy fix with a few strips of Velcro. I have read many reviews on this tractor and find most just complaints about very small items that can be found on any product. Yes, there are lemons in everything, even Mercedes Benz but that doesn't make the entire fleet deficient. I am perfectly happy with my GT5000 and with what I have put it through so far am quite surprised I have not had to call for real repairs. I would recommend this tractor to my best friends and enemies!! GREAT TRACTOR and the price is also very good. If you think Husqvarna is better, think again. The same company (AYP) makes both CRaftsman GT500 and Husqvarna. There is however a Husqvarna garden tractor with a fabricated 52 inch deck which should be more durable. Do not know about the quality of pulleys though.